Skip received his Bachelor of Fine Arts in Crafts with an Emphasis in Pottery from the Memphis College of Art. He was a studio potter for almost three decades and taught at Millsaps College in Jackson, Mississippi for 21 years. An award-winning artist, he is published in Ceramics Monthly and The Crafts Reports, and has been included in articles from House Beautiful, Mississippi Magazine and Studio Potter. So, what is his connection with digital art? Skip got his first computer in 1984 and began developing skills in graphics and desktop publishing. He started using CorelDRAW in the late eighties, but didn’t discover Corel Painter X until 2008. Since that discovery, Skip has immersed himself in digital art. Passionate about Corel Painter, he is a beta tester and member of the Corel Painter Advisory Council. In 2011 he was named a Corel Painter Master. “I love to teach;” Skip remarks, “I find that it is a wonderful sharing experience. Skip is looking forward to sharing his knowledge of Painter 11 and 12 with those anxious to learn Painter and the digital creative process. Besides teaching at the Digital Art Academy, Skip enjoys making custom brushes for Painter. While he has made Impasto and Liquid Ink brushes, his favorites are Watercolor. Articles written by Skip can be found at Digital Paint Magazine. What a treat to see your wonderful blog Skip. I utterly love your paintings and know first hand how good you are as a brushmaker as well as a Painter. I will be checking back often. I will also be following your work on the Painter Talk Forum!!!! Just read your post on Painter 12, there wasn’t a Comment area on that page,so I’m commenting here. I LOVE Painter 12!! I think we are all going to have an ‘experience’ learning to use the new Real Watercolour Brushes, but in the end it will be well worth the effort. All the other enhancements and new things are so very useful and well thought out! I keep coming across them with joy and suprise. I’ve been like a kid in a candy shop the last few days since I downloaded a trial version. I hope to be blogging about some of them soon too! Looking forward to your video’s on 12! nice site skip – and the sumi-e paintings of your’s are terrific. I just joined the free Painter Talk site (for $5) which never expires ( except for sometime in 2014) – but I digress. I was looking for the webinar that you and Karen did about using the Eastern brushes – but couldn’t find it. Could you provide an active link for it. Sorry for the delay in responding. My Painter 12 Class is going strong and has grabbed most of my time. Thanks for dropping by. I’m not sure I still have that video that Karen and I did, but I’ll take a look. Karen may have it if I don’t. When I find it, I will post it with the brushes. I was able to find the link to the Eastern Water webinar. I have provided a link to see the video on Eastern Water Download Page. There is also a link for downloading the Eastern Water Category. I found out about Painter Talk’s new fee. If you charge a nominal fee, it reduces the number of spams and bots. All new folks pay a life-time fee of %5.00. You are correct, there is now a fee to Painter Talk. I watched your videos on Splashing Water and they were very helpful. Glad you came by and you are most welcome. I have fun with those Splashing Water brushes; I hope you do too. I wonder if I may rock the boat? I am an 84 year old photographer and have recently become fascinated with the digital paint aspect – I do not share the photographers view which is tantamount to “illegal”. However I have no painting skills but the interest remains. Photoshop has now woken up to the potential and is including brushes and controls that are being used very successfully by many. I use Photoshop – I cannot really afford Painter. While this blog concentrates on Painter in the final analysis if the SKILL is there should not Photoshop be just as good as Painter in the end. Would it not make sense for me to try to develop skill using the software I already have? Thanks for stopping by and posting a comment. You are not rocking any boat; I enjoy hearing from visitors. My first comment would be that trying to compare Photoshop and Painter is like trying to compare an apple with an orange as they say. Painter and Photoshop are very different programs. The choice to use one over the other has more to do with the manor in which you wish to work. Currently, when I use Painter, it feels and looks like I am painting with traditional media…this is done in a dynamic way. Photoshop CS5 has its new mixer tool, which is the closest thing it has to painting traditionally, but it is limited compared to Painter. I don’t consider one program better than the other, they are just different. I like the way Painter works, so I use Painter. I also have Photoshop CS5, but I use it more for my photographs than for Painting. I think what is most important in your choice to use one or the other is the one you mentioned…money. If you cannot afford Painter and Photoshop, then by all means, stay with Photoshop and find classes that will help you develop your Photoshop skills to produce the images that are pleasing to you. I think you will be very happy working with Photoshop. I have my intous5 up and running and I LOVE it. I am practicing with it and all the new touch features so I can be ready for the upcoming classes. I plan on taking many more, I want to do all of the beginning classes then do some of your watercolor classes. You will be a head of all of us…sigh. I may not have a 5 by then. Enjoy your play. Your blog is wonderful. Thank you so much for the great tutorials and brushes you donated to the art community. I found out about you and Karen Bonaker recently while browsing Painter tutorials online and found Karen’s article My Favorite Painter Brush. In that article she mentioned of your Digital Sq Cool Blender brush for Painter 12.1. I never used watercolor in Painter I would like to try it but couldn’t find it at your blog. I was wondering if that brush is available for download. It is a digital watercolor variant instead of a watercolor or real watercolor variant. It is one of my favorite brushes for blending, too. Thank you Skip. I got it. I will try to install it tonight. Great…I hope you enjoy using it. hello i really love how you create such beautiful pieces of art keep going…. Thank you Sandie. I hope you visit often. Skip, I need some clarification and you are so good at that…in my painter 12 program prior to the release of 12.1, I downloaded all the brushes. They sit in their own listing with I press on brush library. Should I delete these brushes and redownload so that they will all be in the same area as the Painter Brushes? Being the way they are presently I get the one category I choose but they open separately rather with the other painter brushes. Have enjoyed your presence in Karen’s Summer skies studio. When will you be offering the next webinar? They are too good to miss. Take care and thanking you in advance for your attention re: the above. 1. It isn’t necessary to do the move, but I moved mine because it is tidy and I am following the Painter organizes brushes. So it isn’t necessary, but I would do it. 2. You can delete them and then automatically reinstall any that you have set up as a library or category file or manually install the ones that you do not have the special 12.1 file. 3. Ok…now I am confused about the second part. I think you are asking if you can put the custom categories into the Painter Brushes Library. If that is correct, then yes you can do that. For instance, if you download splashing water.brushcategory and double click the file while you are in Painter Brushes, the category will install directly into Painter Brushes…but I do not recommend this. I think it puts too much pressure on RAM to have all the brushes loaded into Painter Brushes and prefer separate libraries for the brushes. So my preference would be to get the file Splashing Water.brushlibrary. Double clicking it will load the brushes into their own library. But, that means you have to go through opening the library in order to get to those brushes, which most folks do not want to do. But, there is a short cut. All you have to do is make a Brush Library Custom Palette. Drag a brush from each library to a custom palette. Name the palette Brush library or something to tell you what it is. All you have to do is click on the brush in the custom palette and you switch to its library without going through the library panel. It is very cool and makes switching around very easy. I hope I have answered your question, but I am not sure. Yes, you did it again Skip. I think I understand, and if I don’t I’m confident you will help. Wasn’t Summer Skies Studio fantastic. Such great work by all. Thanks for being with us. Hey Kathleen…Glad it is understandable. If you have more trouble…just let me know. Thank you so much. Yes, I studied at the Memphis College of Art, but it was called the Memphis Academy of Art back in my day. I loved Memphis and that school. It was definitely one of the highlights of my life. Well now Susie helped clarify just why you are such a great teacher. I’m not surprised. I first thought meeting you that we have a guru working with Painter and helping so many at the same time. Hey Kathleen…a guru…now that is funny. I’m just an ole coot who enjoys using Corel Painter. Spent a lot of time in here today! I’m researching. 🙂 Will be buying Painter in just a few more weeks (have been saving my nickels and dimes) and wanted to surf around for tutorials. I’ve changed my mind though, I think classes might be a better approach. Will keep DAA foremost in mind. Thanks for all the beauty I found and thanks for all the work in presenting it. I am so excited to see someone from Jackson visiting the blog and leaving a comment. Thank you so very much. I don’t get home often. I am definitely due a visit to see family and friends. My 50th High School reunion was in April and I couldn’t make it. I had so much going on I just couldn’t get away. Believe it or not I was surprised to see you’re from Jxn. Not often that happens! 🙂 I could use some advice on Painter versions. I can get 12 but I’ve purchased a new Wacom and it’s shipping with Essentials. Would I be able to follow the classes with Essentials? If I could it would give me more time to find more nickels and dimes. 🙂 Painter 12 is a serious outlay of cash. Could you please advise me? We don’t have any classes at DAA for Essentials and you would be lost trying to use it rather than Painter 12. But, why not do this. 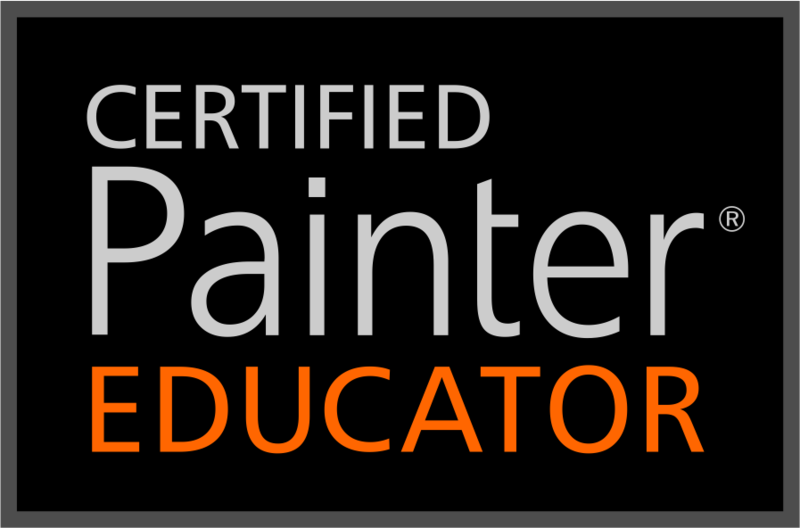 Take one of the classes and download the free trial version of Painter 12 the day the class starts. Classes last 4 weeks and so does the free trial. That way you can try Painter 12 learning about it at the same time. At the end of four weeks, if you don’t like Painter 12…no problem…don’t buy it. In the meantime you will have Essentials and can compare the two. Sound advice. 🙂 Thank you, I’ll check into it. Terrific. I see you signed up for a class. I think you will enjoy the class and Painter 12. I’m having a ball! Finished with Part 2 and on my way to Part 3. Do you outsource your storage here? I’m getting an error on every brush I attempt to d/l. Any ideas? Yes, I do outsource my storage to You Send It. Lately, they have had several problems with down and uploads. Try again later. Let me know when you are able to download. I’ll check from my end and see if there is something going on. Finally got ’em! 🙂 Now to figure out how to use ’em. I have a piece of pottery marked Springwood Pottery that I love! Are you still making pottery? You have made my day. I love it when I hear about folks who love their pots. Someone once told me that she drank her morning coffee out of a Springwood mug. She said it was like having coffee with me. Wasn’t that sweet? I think that is what I liked about making pots the most. They are tangible, nice to touch or view…personal…that’s what I think about handmade pots. I am so glad you stopped by and left me such a nice note. It has been a while since anyone has mentioned Springwood. Skip, I so love what you do for the digital art community. Thank you! Your videos have been very helpful to this beginner. My problem today is with a dumb thing I did. Somehow I docked my color wheel in the right upper corner where the grab bar is out of reach, and so is the clone/color switch. I can’t move it. And of course Painter always remembers where it was so closing it doesn’t help. Any suggestions on how I can move it? Go to Window > Arrange Palette and select default. That will bring it back to the default screen for Painter and your color panel will be accessible. Now rearrange everything the way you like it, then go back to Windows > Arrange Palettes and save the arrangement. Then if you ever get your workspace all messed up, you can get it back very quickly. Thanks so much for the nice comment, too. I am glad to hear the blog is working for you. I am totally new to digital art and I am most likely doing something wrong but nothing happens when I click on the green “DONWLOAD” icon on the “yousendit” page which appears. I was trying to download and “save as” some of the brushes but do I have to “sign up” / “Login” first at “yousendit” ? No you should not have to sign up to get the download. You will see that in the upper right hand corner, but just ignore it and click on the download button. If you will tell me which brushes you were trying to download, I’ll check them. Maybe they have expired or something. I’m on a Windows machine using IE 9, and I get a window that pops up asking if I want to save or save as. I pick save as and place in my documents. Let me know what kind of computer you use and your operating system and browser…maybe we can figure out what is going on. Many thanks for your reply – I appreciate your help. As I mentioned I am just about getting into digital art after many years with ordinary brush & watercolour paints. It is very tempting to jump direct to Photoshop, but I feel as if it might be an overkill to for a start, therefore I have downloaded a 30 day trial version of Corel Painter 12, and I am very pleased and impressed with it. Another good reason for choosing Painter is the price jump. Here in Denmark you can get Painter 12 at about 440 US $ compared to Photoshop CS 6 at about 1350 US $, so you see what I mean. And again Painter seems to fulfill my needs at my level as an amateur artist. My PC setup is as follows: Windows Vista 64 bit – Intel Quad 2.5 Ghz – 4 GB RAM, so quite a good set-up I presume. My browser is IE 9 as yours and I do exactly as you do when trying to “save” the .zip files. Btw I have bought a Wacom bamboo Medium taplet and it works great with Painter. What I have done is I have copied screen dumps of the process and where it says in Danish “Gem som” – this is “Save as” – and nothing happens. ups: I can see that the screen dumps will not be displayed, so disregard. I believe that IE 9 must have some problems when it comes to downloads as well as opening / displaying Adobe PDF files. I have previously had problems with PDF files to open up from IE 9, whereas IE 8 and IE 7 works perfect. What I did now is I tried Google Chrome browser and there is no problem downloading your brushes, so problem solved I guess. I´m sure there must be a tick-off/on somewhere in the IE 9 which is wrongly put and which causes the problem. I am a big fan of your work and have been doing a little brush making myself. I wanted to ask if I can share these with you by email or something, as I think yoiu will like them and perhaps share them with others. Sounds like a great idea. I’ll send you my email address. 2. On the canvas layer create the shape that you want to use in black. This can be any image…lines, boxes, a photograph…whatever. It must be in gray scale and reside on the canvas layer. 1. Select the FX > Shattered variant and click on the reset button on the brush property bar. 2. Go to Brushes > Save Variant and save the brush with a new name…for instance, Clan Shattered. 3. Select FX > Clan Shattered. 4. Make sure the brush dab you created is open and you are on the canvas layer. Clan Shattered will now be using the new dab that you created and it will act exactly like the original Shattered, but with your dab not the triangle. This is a quick and dirty explanation. Let me know if you have trouble. I tried what you suggested. At first, it didn’t go as planned. But finally, it is working. I was wondering if you or anyone on your blog had a tutorial on how to add handwritten letters as a collage, I am using painter X, I want to be able to scan in writing and not have any background only the words. 1. Scan the handwritten note. 2. Save it to your desktop or somewhere you will be able to find it again. 3. Open Painter and open the collage image. 4. Do not open the scanned image. 5. Go to File > Place and when the navigation window opens, go to where you saved your scanned image and select it. 6. The file will appear in your collage image; accept it; move it and resize the placement and you are done. It will come into Painter on its own layer. Hello Skip. My name is Jack and I chose you for a research project at school. I was wondering a couple things about you, what inspires you when you do art? What kind of theme do you use in your art? Lastly, what advice do you have for a beginning artist like myself? I really hope you write back. I LOVE your work. Thanks Jack. I will reply to you privately. Your project sounds fun. Hi Skip, I’m wondering what brushes you use in your Sumi’e paintings. I’m trying to create my own brushes for Sumi’e but just not getting there. I’m using Painter 15. Thank you for any and all info. Your blog is wonderful. Sorry for the late reply. I have been away from home. Gosh, I use a variety of brushes. I started with my Eastern Water variants and if you search the blog for Eastern Water you will find some stuff about them. But, today, I sort of go all over the place with various custom watercolor brushes I made. I wish I could be more specific. Maybe I can do a video about Sumi-e some day. Skip that would be awesome if you could do a video on sumi-e some day. Skip – I’m a traditional artist using acrylics, oils, watercolors, etc. I also have over 200,000 slides I have taken over the last 50+ years that have been digitized. I bought Painter about a month ago for the sole purpose of making paintings out of some of the best slides. Problem is, all the tutorials I have been able to find assume the viewer has some experience with either Painter or Photoshop. I have neither. What I really need are the steps to preparing Painter to do what I need to do. Is there a tutorial that will lead me through each step in loading what elements I need to make paintings. I know NOTHING about Painter and am very confused. The tutorials I have seen already have the elements needed loaded on the “screen” and are then just clicked on to perform a function. BUT where are those elements located? A tutorial that assumes nothing and is for a REAL beginner is what I’m looking for. If I can get this part of Painter working I can then experiment and go from there. Thanks for your attention in this matter. You can reply to my e-mail if you want.